Is there a better alternative to Minute Timer X? Is Minute Timer X really the best app in Cooking category? Will Minute Timer X work good on macOS 10.13.4? Minute Timer X is a utility to help people time events and have lost their egg timer. Set up an event of any number of minutes and seconds (default is 1 minute). The ticking, 10-second warning and final buzzer sounds are all configurable. A simple application, but surprisingly useful for games, cooking or exercising. No need to watch the hourglass or wait for the sand to return to the bottom. The file download contains versions for Mac (Universal Binary), Windows and Linux. Minute Timer X needs a rating. Be the first to rate this app and get the discussion started! [New] Single keystrokes now enable common functions: SpaceBar or â€˜Sâ€™ to start and stop the timer, â€˜Râ€™ to reset the timer and â€˜Pâ€™ to show the Preferences menu. [Fix] Quitting the application while the timer is running no longer causes a crash. 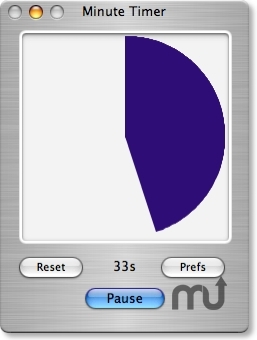 [Fix] Resizing the window now refreshes the pie chart properly. [Fix] The text in the buttons show up properly on Linux.